Ever since its first 2005 edition, the GFR has represented a unique platform to promote global awareness of migrant remittances and to highlight the immense impact of the money sent home to developing countries. The GFR 2013 highlighted the global implications for the remittance market and an in-depth review of barriers and opportunities in the Asia-Pacific region. The main objective of the Forum has been to stimulate the debate on today’s market realities and tomorrow’s opportunities. In this sense, the three day event helped create the foundation for a common agenda for the Asia-Pacific remittance market. 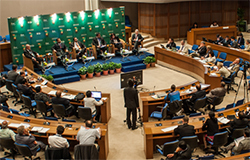 Over 350 international participants, including experts and representatives from leading business groups, government regulators and the civil society, attended the GFR2013.